Anyone with any more information on this one is welcome to contribute to the discussion. This set comes in the usual box with the hinged lid, lined in orange on the inside, the three different coloured inner-bags (which are light paper), and it has the the big George Harrison poster. All printed in the USA. 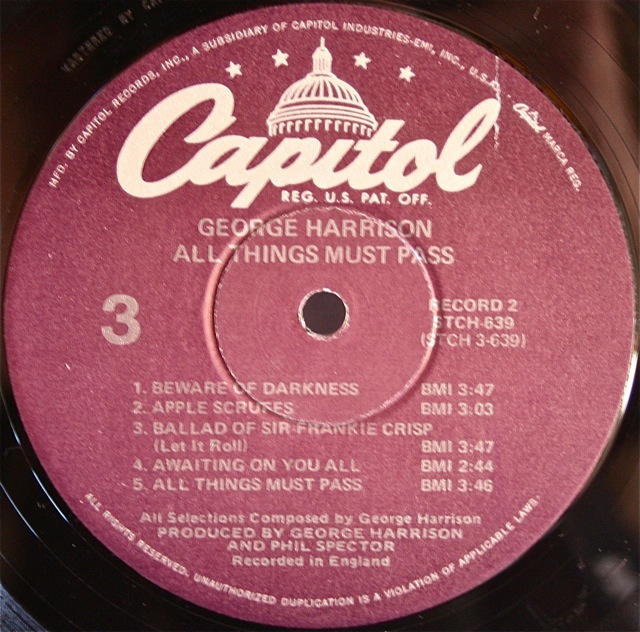 This entry was posted in Beatles, Beatles Collecting, Beatles Related, George Harrison and tagged All Things Must Pass, Apple Records, Beatles, Beatles Collecting, Beatles Related, Capitol Records, George Harrison by beatlesblogger. Bookmark the permalink. Market. I’m trying to figure out when it’s from. It has an all white inside cover instead of orange. It does not have clapton’s name listed, it has two orange apple labels and one green apple jam label on the vinyls. There is a hand written number in the dead wax: stch (side number) and a g-8. On the first disc there is a letter scribbled out and a s shaPe with a r and a c inside of it. The font on the labels is the same as on the cover. The three record sleeves are purple, grey and what I would call dark green; not mustard. There are no barcOdes or serial numbers. 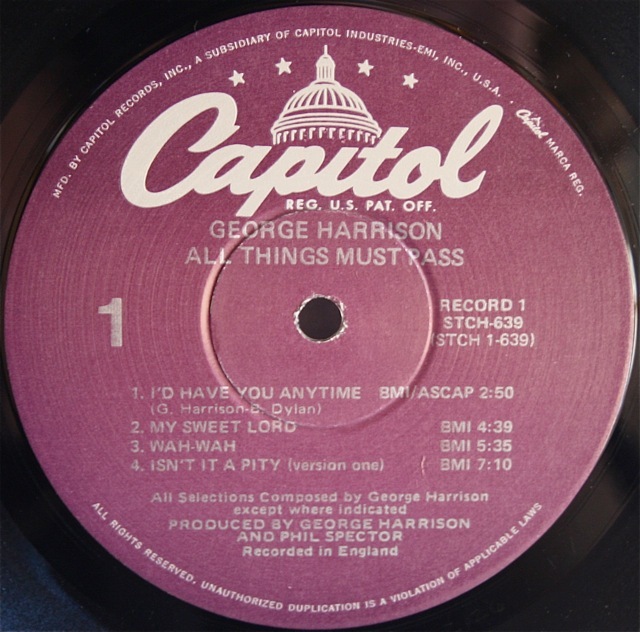 The spine reads George Harrison/ All things must Pass stch -639. Box is printed in USA. 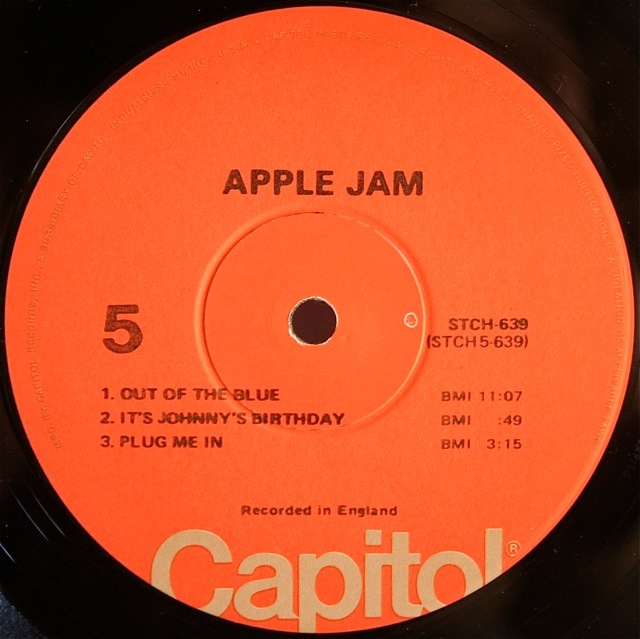 There is no writing around the apple disc labels except mfd by apple records inc. Anyone has any idea what pressing this is I would love to know thanks! O just to be clear , the dead wax reads “stch (side) 693” then it has g- number . This set is near mint and I have a hard time Believing its 40 years old. I didn’t ask the vender just because I was so excited to find it. I went to the flea market only wanting to find this record. I paid $30 for it, he wouldn’t budge on his price but the condition was so good I didn’t care. It does have a poster too, not sure if I mentioned that. I hope my description was clear enough, if anyone reading this has time, please give me your answer to what pressing you think it is, THANKS! Ryan, it sounds like you have the UK release. About the orange unsliced Apple labels. There may have possibly been an abundance of those labels.Why? I have no idea.The only reason that I think that is, McCartney’s Band On The Run was pressed with full Orange (All Things Must Pass) Apple labels on sides 1 & 2. I saw one on Ebay a few years ago but it had already sold I believe. I’d LOVE to find one for myself as I am fascinated by different Apple variations.